I have the privilege of knowing Harry Doskicz, an extraordinary pilot and aircraft mechanic. His shop is a destination for all kinds of small aircraft, including gliders and cloth-covered singleprops. Hang around Harry for any amount of time and you’ll learn something. Harry likes the motorcycles I bring by the hangar (the sketchier, the better), and he’ll occasionally mention his 50 cc “Tohatsu screamer” he used to ride around back in the day. Aside from a Mobylette moped perishing in a back hangar, the repair shop doesn’t see much moto action. So I was immediately interested when Harry told me about an experimental Kawasaki-powered airplane he had in a hangar. When he said he’d helped build the plane and they’d fitted it with a two-stroke, I grabbed a camera and got this story. Harry couldn’t remember exactly what engine they’d pulled out of a junkyard to jam into this tiny plane back in the early 2000s, though he was pretty sure the frame that held it was a motorcycle of some kind. He recalled a displacement of around 400 cc or so. I crossed my fingers that he’d found a KH400 or something equally nutty to get this little marvel in the air. An aluminum "cage" sits on top of the wooden fuselage. Photo by Andy Greaser. Truthfully, I was a little disappointed to discover that the engine wasn’t out of a motorcycle when we pushed the hangar doors open. It probably came from a snowmobile. Now, there’s a chance that the engine was in a motorcycle frame, but not from the factory. I’ve seen builds with big sled engines in bike frames. Sounds like something that might crash, and end up in a junkyard… Who knows? I’m still going to show you around this amazing aircraft, because I think this plane and aviation in general have a few things to say about motorcycling. Kawasaki's N100 project resulted in some fearsome motorcycles. Kawasaki photo. This carb will look very familiar to anyone who's owned a bike with Mikuni VMs. Photo by Andy Greaser. 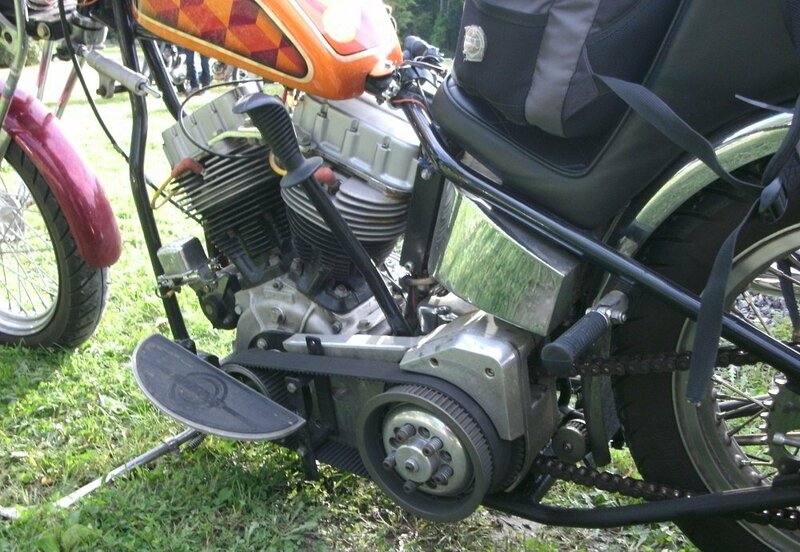 A Mikuni round-slide carburetor feeds premix to the two cylinders. It looks and works just like the ones installed on my Kawasaki motorcycle. Peaky power delivery might not be desirable on the ground, but aircraft usually set a speed and hold it while cruising. This airplane can simply cruise in the healthy end of the powerband, probably between 5,000 and 7,000 rpm. In its current state, the little Kawasaki might make 40 horsepower. Kawasaki didn’t advertise the 440 for use in aircraft, but that didn’t stop experimental builders from stuffing them in their projects. It’s since become a well known alternative to Rotax offerings. That’s where Harry, a Rotax specialist, comes in. I’ll let him explain this machine. You're on your own in this vehicle. Photo by Andy Greaser. Common Tread: Harry, can you tell me what’s going on with this plane? Harry Doskicz: Well, it’s… one of those! A real front-spinner! I don’t know how to explain it to ya. The fellow who built it brought it to us mostly in pieces. He started it, couldn't finish, and we got it flying. Now, it looks like it’s incomplete, but this isn’t a fully covered plane. You can fly it exactly the way it is (pointing to the exposed wooden frame). You don’t have to cover the fuselage. The wings are flying the plane, not the fuselage. The pull cord to start the engine lives behind this door. Photo by Andy Greaser. I built the whole cowling from scratch. I made the louvers, all of it. I made it all up. We put a pull-start on it, and you reach in this little door to access that. Pretty clever suspension using bungees. Photo by Andy Greaser. We put the [landing] gear together, you can see the heavy-duty bungees on there, actual bungee cords. We had to reinforce that because it was a little too thin for ground operations. We did lots of testing on the rudder cables to make sure we had good control, and we had to rebuild the stabilizer with new flying wires. After that, we covered it all. The pitot tube is integral to measuring airspeed. I've seen motorcycles actually running these setups. Photo by Andy Greaser. CT: How about instruments? What do you need to fly this thing? HD: We put a tach in it, pretty sure that works, and the airspeed indicator. That definitely works. It also has an hour meter. Look at the base of the prop blade, and you'll spot the wedges used to adjust its angle. Photo by Andy Greaser. CT: And the cylinder head temp gauge? HD: Oh, that doesn’t work yet. It just looks good. But the tach was set up with a hand tach, which is a tool that watches the prop and gives you a reading of how fast it’s spinning. We figured out what it would need to get off the ground. Once you have that set, you can adjust the pitch of the blades to dial it in with wedged shims. That’s called a ground-adjustable prop. They're not uncommon on planes like this. If it works, why mess with it? Photo by Andy Greaser. CT: How about your exhaust? What's the story with that? HD: We just made it with an exhaust we had from something else. We ran the manifolds together and connected them, then they run out here (pointing to cowl). The engine runs pretty good this way. If you look in the vents, you can see the cooling fins on the "tops" of the cylinders. Photo by Andy Greaser. CT: And you have the heads… upside down? HD: Yeah, that’s why the vents are cut in the bottom, and the louvers are here on the side to pull the air through. That’s how it fit. CT: So there’s oil sitting on the back side of the piston, right? HD: Yeah, but it works! There's no reason you can't run it that way. CT: Where’d you source the carb? HD: That was just the right one for the engine we had. You might put that on a Rotax or something. And it performed pretty good! Well, the plane got it in the air. So it definitely performed. CT: And this is a premix... airplane? HD: Yeah, you have to mix the gas and oil on the ground. It has a five-gallon tank, and you could go pretty far on that! With that drive, it has four or five V-belts. We had to adjust the angle of the V somewhat to get it to grip better and not lose power. Nowadays, they mostly run one wide cogged belt with matching pulleys. This one just happens to use the old V-belts.The belts, engine, carb and everything were just set up to get it to fly. You could put something bigger and better in later, and lots of people do that. Control wires like these are routed throughout the plane. Photo by Andy Greaser. CT: So was this a kit plane, or what? HD: It was a plan plane. You buy a big set of plans and follow along, making changes where you need to. CT: I’d love to see those plans. HD: Well, that’ll cost ya five dollars. CT: I’m suddenly losing interest. I feel like this plane ended up being a little different than those plans, anyway. This thing is unique. HD: It took us three or four years to get it together. It took some testing especially getting the cables right, and there were a few parts we beefed up to make sure it’d hold. Even though [this plane] is a simple thing, those of us who work in the industry each bring our own strengths to a plane like this. It’s sophisticated in its own way. The plane could use more power, but as it is, this is what it should be. Fly 'em, don't hide 'em! Photo by Andy Greaser. What does this have to do with motorcycles? I love this stuff. It's too bad the engine wasn’t a definite match to a motorcycle, but I think there are still a few things here that can be applied to motorcycling. Horsepower isn’t all it’s cracked up to be. 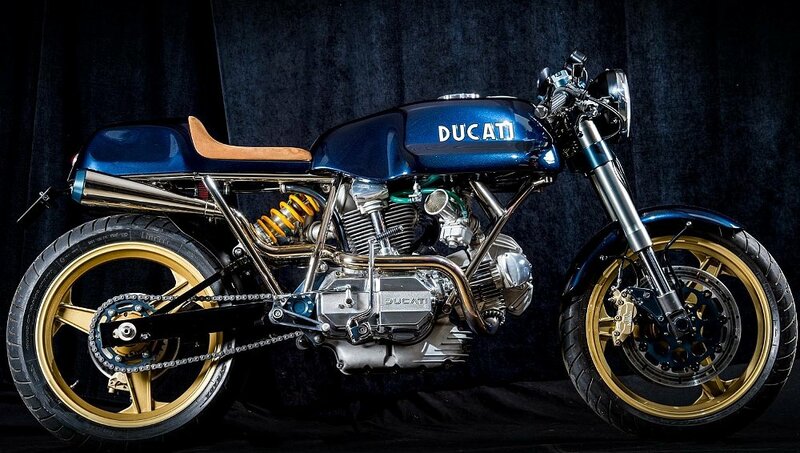 Lemmy, Joe, and Spurgeon recently discussed small bikes, particularly the fixation with horsepower you’ll find among this class of motorcycle. Next time someone’s going on about the Ninja 400 or the R3 not having enough horsepower, remember this: a similarly sized engine is capable of providing sustained powered flight. Don’t let displacement and horsepower bashing get you down. Nothing wrong with wanting more power, but all you really need is enough to get down the road... or the runway. We aren’t alone. Despite some positive recent news about ridership, motorcycling struggles to bring new riders into the fold. We might have it bad, but aviation has it worse. Pilot shortages and a plummeting interest in personal aircraft have plane prices falling quickly as old pilots age out and young people fail to replace them. I’m talking new sport-tourer money for a decent two-seater Cessna! Programs like Young Eagles work to give kids a chance to try flying in a safe, accessible way. And they're connecting volunteers with aspiring pilots for free. My brother took up aviation after his Young Eagles flight, as did most of the student pilots he met along the way. Motorcycling would do well to watch other industries’ solutions to shrinking numbers. Just think: Where would you go to try motorcycling for the first time if you didn't know a rider? Two-stroke technology still has a place in the world today, and maybe a bigger role in the future. Light, simple two-stroke engines are prized among builders of light aircraft like this one. I spoke with Harry about the advent of fuel-injected two-strokes, and he believes that they’d have a big impact on the world of personal aviation if manufacturers would bring the tech to small aircraft. Just as two-strokes are making a resurgence in the moto world, aviation also stands to gain from a new generation of smarter ring-a-ding-dings. Instrumentation is sparse, but includes another moto reference: a Rupp tachometer. Photo by Andy Greaser. Motorcycling can turn up in the strangest places. So maybe it wasn’t a motorcycle engine in the end. (Does the Rupp tachometer count for something?) Even so, your personal riding/wrenching means that you can understand and appreciate something different with a little perspective. I get it, you’re probably not an aircraft mechanic, but that Mikuni carb works just the same as the one you helped your friend rebuild last winter. Or maybe you read about Suzuki flipping the engine in a recent patent to try to solve the same kind of space constraint problems that Harry had to deal with. These worlds are all interrelated. In fact, I'm told being a pilot helps make you a better motorcyclist (don't neglect those prechecks! ), and I’ll bet motorcyclists are disproportionately over-represented among pilots. 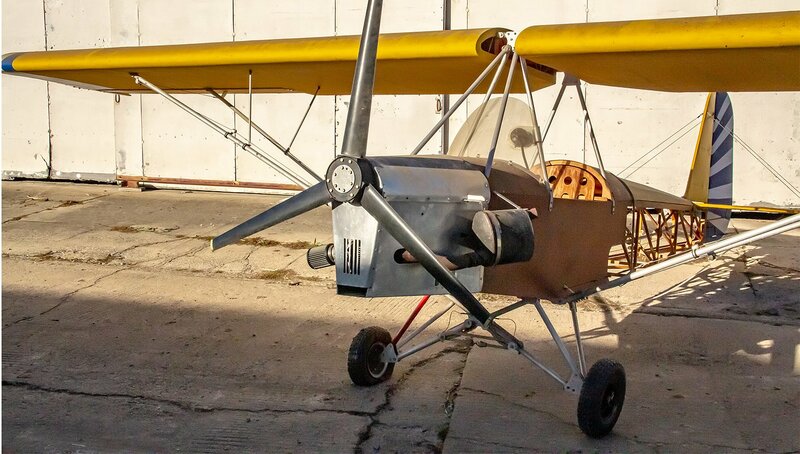 There’s a certain kind of fun that doesn’t appeal to everyone, and that kind of fun built this airplane and so many other weird and wonderful vehicles. Thanks to Harry for opening the hangar for a look at his Kinda-saki.